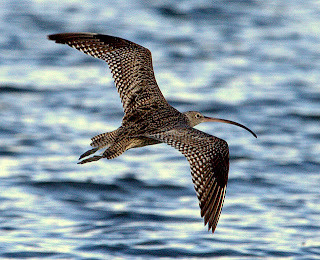 On recent high tides, the 2 Eastern Curlew that frequent the Ralph's Bay area, have roosted on the Lauderdale Spit. I've always found curlew fascinating, but rarely managed to get even close to them, save for one early morning encounter some years ago. My son and I had been mist netting waders at Orielton Lagoon all through the night, with moderate success, and at first light we were about to call it quits. My son, then in his early teens, made one last round of the nets. As he walked back I watched as he appeared and disappeared in the early morning mist, and, confusedly, he appeared to be carrying something quite large under his arm. From a distance, and in the mist, it appeared to be a chicken! As you can guess, it was indeed an Eastern Curlew, not a species we had expected to catch, and the one and only I have ever handled. From memory it was a female, and had fattened up for the long haul back to the b reeding grounds in Russia and North East China. It weighed in at around a kilogram. These days, sadly, the numbers of visiting Eastern Curlew have drastically declined. In Ralph's Bay the decline has been from around 20 or so birds, 30 years ago, to just two in recent times, and if the proposed development takes place in the bay at Lauderdale, it will be zero. Very wary birds and amongst the most difficult to approach, their presence on high tide roosts is one of the few opportunities to photograph them. However, undue disturbance at these roosts is a "no-no". So it was with some trepida tion that I attempted the accompanying shots. As you may see in the the shot of a curlew with Pied Oystercatchers, while the oystercatchers weren't too concerned with my presence, the curlew certainly was, and it took flight while I was still a good distance away, taking some of the oystercatchers with it. I retreated, and the oystercatchers quickly returned. 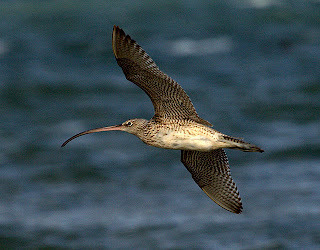 The curlew, however, continued flying around, which at least enabled me to take a few flight shots. It then briefly alighted next to the second curlew (which had continued to roost a little further down the spit), and somewhat surprisingly, a brief skirmish between the two broke out, resulting in one taking refuge back among the 100 plus oystercatchers. The above episode was over in a matter of minutes and I was anxious to cause no further disturbance, so I was happy to just stand and watch them from a respectful distance, and enjoy the moment. 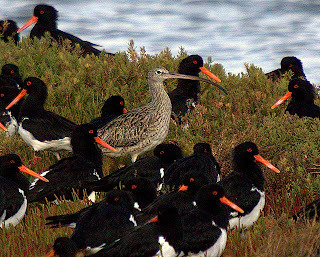 By the way, what's the best way to tell apart Whimbrels and Curlews and where are the best spots.